Full Replacement Dash - After market full replacement dash with lifetime warranty. Real True 10 Minute Dodge Cracking Dash Remedy - This is a youtube link from a auto / truck show showing a very simple real remedy for the thousands of Doge, Chevy (and others) dash cracking issue.This is a 10 minute part/fix. Please watch this is real and will help you. Dodge Ram Cracking Dashboard Lawsuits - From the website: " If your Dodge Ram has experienced a defect in its dashboard that goes beyond normal wear and tear, you might be eligible to file a Dodge Ram Defective Dashboard lawsuit. We are currently offering free legal consultations to owners and lessees of 1998-2007 "
This is a known problem for Dodge trucks in this time frame. 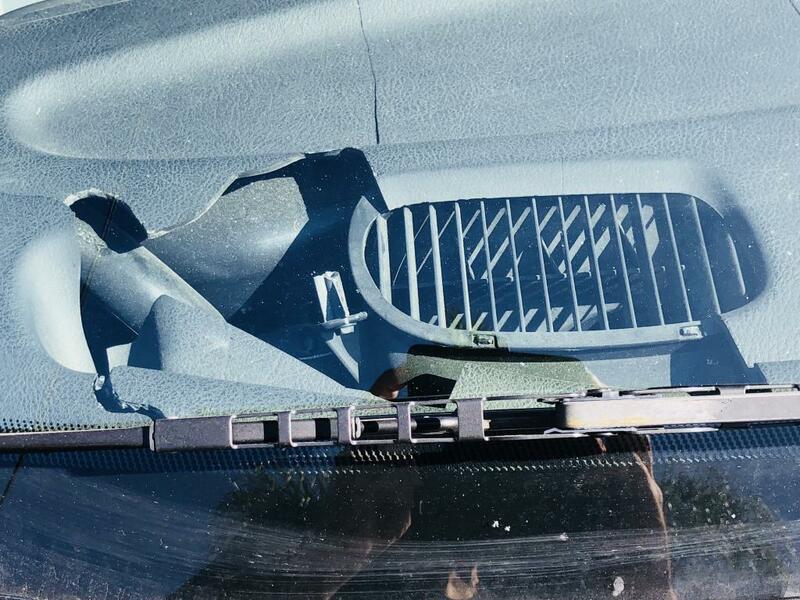 If this vehicle were to be in an accident sufficient to deploy the airbags, sharp plastic shards would be propelled everywhere, including the face and eyes. I would be happy to pay the cost of the replacement dash if it was at cost. Some dealers want over $700 just for the part other online dealers will go as low as $400 but you have to ship it. Dodge could sell it to us for $100 and not lose a penny. They would rather make a profit off their faulty product. I bought this truck new. I have maintained it regularly. About 2 years ago I noticed a large crack in the dash. Since that time the cracks have expanded until pieces are falling out of the dash. If I have even a minor accident the sharp pieces of this broken dash could injure me or my passenger. I looked into having the dash replaced and was given a price of more than $2000. This is too much for me to be expected to pay to repair a defect that is totally Dodge’s fault. There should be a recall on this. 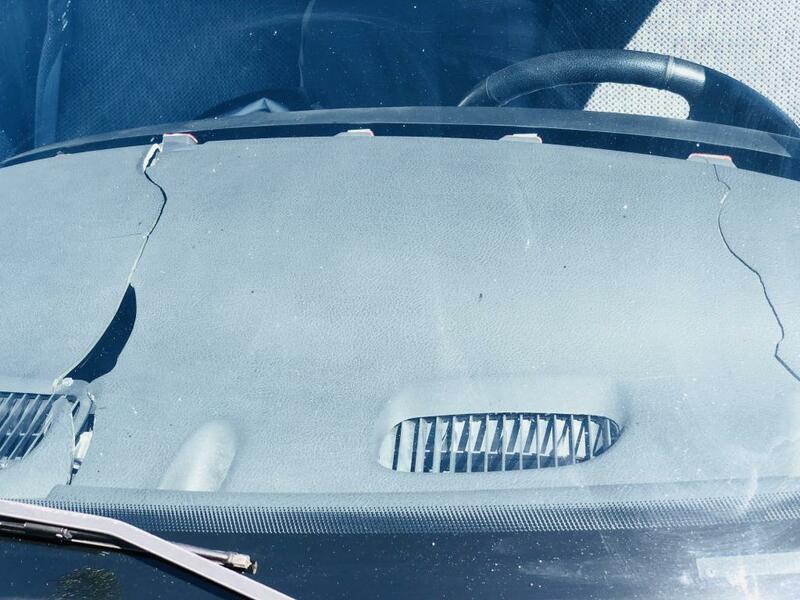 The plastic dash cover has severely cracked in multiple places with whole pieces becoming dislodged. Dash continues to disintegrate and I'm worried it will be an issue for the electrical and mechanical components within the dash housing and possible causing undue malfunctions, failure or fire and unnecessary repairs to other internal components, but mostly if it could possibly interfere with the deployment of the passenger airbag should an accident happen. My dash is so cracked up that I had to put something over it to keep pieces from coming out when you hit a bump. Sometimes more often than not, the rpm gauge or the speedometer doesn't work. Something needs to be done. I'm a disabled veteran on a fixed income and I can't afford to pay to have it fixed. Shameful that a company would market a total POS product then refuse to fix what they F-ed up. This is not merely a cosmetic issue. Actual pieces of the dash have broken off. Heaven help me in an accident. My own vehicle will be my worst enemy. I have owned two Dodge trucks (RAM 1500) and the dash and the instrument cover have cracked on both of them. I still own my 2001 Dodge Ram and the dash is just falling apart. I have also had the cover over the right pillar crack. I take pride in my truck and have fixed or replaced parts that wear out but to have your dash just fall apart is a manufacture defect. I also work for a company that had a fleet of Dodge trucks and every one of them had the same problem, in fact I have yet to speak to a Dodge Ram owner that has not had the same problems with their truck. Dodge knows its product is defective and needs to fix it. If Dodge wants LOYAL customers it needs to make this right. The dash, in its entirety, cracked into chunks, all of which are deadly in the event of an accident. The dash board and bezel, in a period of months has completely cracked across its entire width and breadth, chunks are all sharp and, in the event of an accident, present a potential for egregious bodily harm, entirely the fault of the manufacturer. Dodge should take responsibility for this malfeasance and should make the dash board and bezel, both of which have become a deadly liability, to anyone who owns this vehicle. It has never been a habit of Dodge/Daimler/Chrysler to let persons risk their lives or their well being due to any design failure(s) on their part, nor should such a habit begin now. No constabulary in these United States would allow such failure go unchecked were such failings a part of any individual or organization, and that would include Dodge and its subsidiaries. What then will be the solution. Continually claiming this design failing is a "cosmetic" issue does in no way relinquish Dodge from their part in causing this disaster and the potential for harm to innocent parties who, trusting in our system of government and laws set forth to protect our citizens, purchased this Dodge product in good faith. It is the sole responsibility of Dodge and its dealerships and their subsidiaries to make this failure aright in compensation. Apparently this seems to be a major problem for an awful lot of this years Dodge P/U trucks. It should be recalled. Definitely a safety issue. 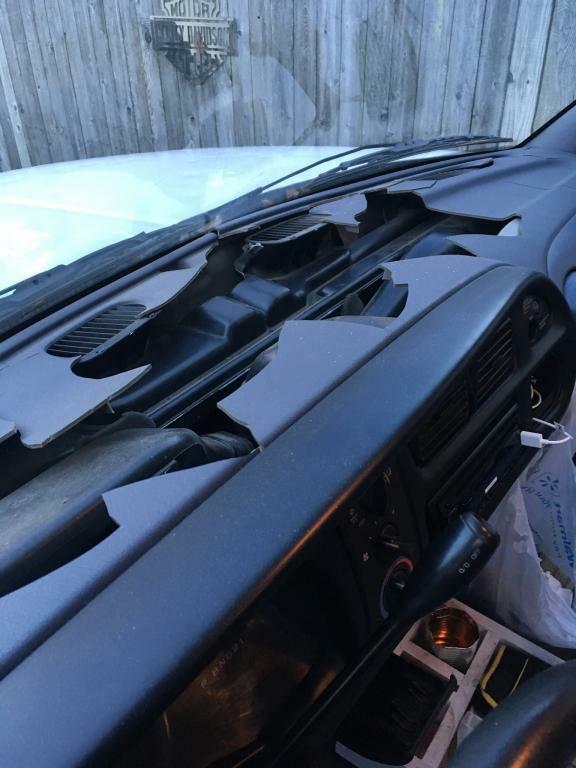 If someone had an accident the dashboard pieces could do some damage to your face or chest. Thank you for listening. Dash started cracking, then large pieces starting falling in, now have it held together with gorilla tape. THE DASH IS CRACKED AND IS FALLING APART IN MY RAM 1500. CUP HOLDER IS FALLING OFF AND THE GLOVE BOX DOOR IS BROKEN. I REPLACED THE COVER OVER THE SPEED OMETER AND PUT A DASH COVER ON THE DASH BUT THE MAIN DASH IS NOW FALLING APART. THE LOCAL BODY SHOP SAYS THERE ARE NO AFTERMARKET REPLACEMENT PARTS AND THE REPAIR IS TOO COMPLICATED FOR ME TO DO. The front bezel and dashboard is all in pieces and needs to be replaced. It is obvious the dashboard and bezel were cheaply made. There are several thousand complaints on this website and Dodge needs to replace this immediately before someone gets hurt or killed. I'm very disappointed in DODGE that they haven't fix this issue with the dashboards. They know it isn't the vehicle owner's fault that this issue happened. I had a 2000 dakota that I never did anything as far as cleaning and maintenance on the interior and it didn't have any issues with the dash. So why blame it on the owner for not taking care of it. They know know exactly what caused it. Never owned a vehicle with this problem. Another problem using plastics where they can cause problems. Chrysler should recall this item as it is potentially dangerous from flying debris both during a crash and simply splinters flying into a person. I want a new dash and I'm not paying for it. Dodge can pay for it, it's their bad parts. THERE SHOULD BE A RECALL FOR THIS. TOYOTA RECALLED THEIR DASHES FOR MINOR CRACKING AND HAVING A STICKY SURFACE. IF THIS IS NOT ADDRESSED I WILL NEVER BUY ANOTHER DODGE.